Yesterday, Anonymous posted that the feud with PJM had "jumped the shark." I was unfamiliar with this idiom, so I looked it up. Interestingly enough it comes from an old Happy Days television episode. A very popular show when I was younger, Happy Days definitely ran longer than it needed to. It was cute at first, but the later shows (especially at the new Arnold's) were a disappointment. To bolster ratings, sometimes they'd mix up the show with an unusual attention grabbing stunt. 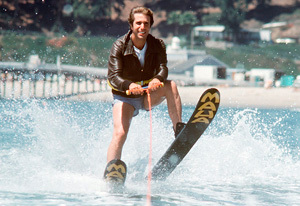 In season five, the crew goes out to Hollywood, California, and Fonzie steals the show by taking on a bet to jump with waterskis a shark being held in an ocean pen. Well Anonymous, thanks for your input. And if this were just a fun blog written for my own amusement, I would certainly change things up and inject new material. But I don't know how to get this across to a sleepy citizenry, PJM of West Texas is a real and dangerous person! And I don't mean to be flippant here, but how many of you have had a Super Villain declare war on you? Ridding the world of super villainy is not an easy process, sometimes the work is not glamorous, but stay with me as we "jump the shark." I hope that didn't scare you all too badly, but I think people need to awake to the danger. 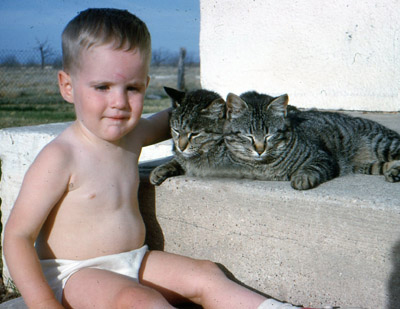 If he can do this with a kitty, imagine what he could do with a mutant peafowl army! An unnamed artist by the initials R.A.M. Certain members of the Multimedia Class at Eldorado High School. Go Mighty Eagles! Of course, additional submissions from my readership are always welcome and may be sent to the e-mail found in my profile. Together we can stop the spread of super villainy! I am rolling on the floor in hysterics! That Nate is one sharp guy. I'm going to stay out of this WAR. The last time I tried to help bring the war to a peaceful end, both of them turned on me. The next thing I knew I was looking over my shoulder and waiting for revenge. and hope that there are to many causualties. You really missed your calling with the mighty PEN, Nate. LOL. I've noticed that PJM just can't keep up with you. Is he even in the challenge?